As Canadians, we welcome the month of May with open arms. The air is warmer, birds are singing and flowers are finally in bloom. The month of May also happens to be one of our busiest months at the Shulman Weight Loss Clinics (you may think it is January... but the closer bikini season gets – the more motivated people are to lose weight!). Although a big part of my professional life is to help people lose weight and get rid of unwanted belly fat – there is much more to weight loss than that. Taking back control of your health and feeling as energetic and fit matters at every age – physically and emotionally. As motivational speaker Jim Rohn said so often, "You really can't do well if you don't feel well". If you have weight to lose or simply want to start feeling your best naturally – I encourage you to just start taking one small health step at a time. Small steps will lead into bigger ones and slowly but surely – your health will transform. Read my 7 steps to weight loss article for a little motivation. And... scroll to the end of this newsletter to see the most amazing before and afterpictures of our Cityline winners – 97 pounds down collectively! If you have a comment or product you would like reviewed, simply e-mail me atdrjoey@drjoey.com - I would love to hear from you! PS – Don't forget – All Shulman Weight Loss Clinics are offering 10% of all programs until the end of May. 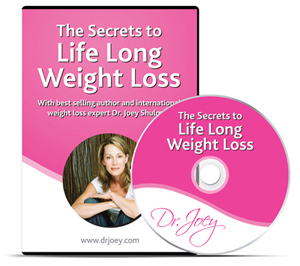 Now you can discover Dr. Joey's Secrets to Weight Loss in the comfort of your own home by ordering her latest DVD! Burn belly fat, boost energy and transform your body with Dr. Joey's 7 simple steps to lifelong weight loss. Order now! Learn the Secrets of Weight Loss live with Dr. Joey Shulman brought to you by canfitpro! Call to reserve your spot at 1-800-667-5622. Have you tried Dr. Joey's skinny|chews™ yet? They are literally flying off the shelves. skinny|chews™ are the perfect chocolaty and chewy option to end nighttime eating and 3pm cravings. Finally... chocolate with benefits! Order 2 or more skinny|chews™ at Dr. Joey's online store and delivery is free! Click here for details. 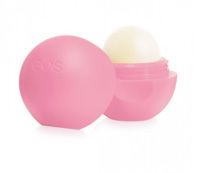 Eos Organic Lip Balm – These colourful, organic lip balms make for a great accessory this spring. With different flavours and colours to choose from – including pomegranate raspberry, sweet mint, honeydew, and strawberry sorbet, this product offers a fun way to moisturize and soften your lips. Eos lip balms are free of paraben and petrolatum and full of amazing ingredients and nutrients such as antioxidants, vitamin E, shea butter and jojoba oil. They leave your lips feeling smooth and refreshed! 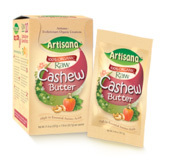 Artisana Single Serving Squeeze Pack Nut Butter – Artisana's single serve squeeze packs come in a variety of nut butter flavours including almond, walnut, cashew, pecan and macadamia. These delicious "on the go" nut butters are chock full of healthy fats, which are critical for optimal health and weight loss. The 'knead it and squeeze it' method makes this product easy for anyone to use and doesn't require any utensils! The raw Cacao Bliss is one of my favorites and is vegan and made from organic, all natural ingredients. Ella's Botanicals Bubblemania – Give your little's ones bathtime a fun and exciting spin this season with this 3-in-1 shampoo, body wash and bubble bath. The natural formula used by Ella's Botanicals is soap free and full of aloe, natural olive oils and lavender essential oils – leaving no room for synthetic fragrances, and unnatural ingredients. 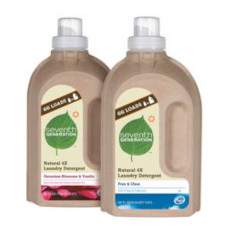 Seventh Generation Laundry Detergent – Are you looking for a laundry detergent that is tough on stains but gentle on the environment? If so, then Seventh Generation laundry detergent is for you! Hypoallergenic, natural and free of dyes and synthetic fragrances – the bio degradable formula works well in all temperatures. With a bright and colourful vegetable like carrots – you know you are getting a rich source of nutrients. 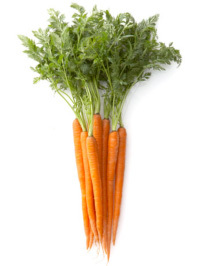 Carrots are an excellent source of beta-carotene – an antioxidant that supports the health of our skin and eyes. Beta carotene also helps to protect against free radical damage – decreasing our risk of cancer. Add all ingredients into blender and blend for about 2 minutes. Put all ingredients into food processor and serve with veggie sticks or crackers! Cook quinoa, drain and put in the fridge. In a small bowl, stir together the olive oil, lime juice, cumin, hot sauce and black pepper. Pour in olive oil mixture and stir gently until well blended. Add more seasoning, if needed. Thich Nhat Hanh and Nutritionist Dr. Lilian Cheung makes a connection between the mind, body and spirit. 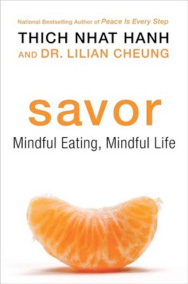 This book puts emphasis on the practice of mindfulness – incorporating awareness eating practices into our daily lives. It also takes a look into a Buddhist's perspective of weight loss and eating. Savor shows us how to eat healthy and incorporate nutrient dense foods while still enjoying a happy and satisfying life. Have you seen the results of our Cityline weight loss winners? Collectively they have lost 97 pounds and look fantastic! Congratulations to Mel, Stefania and Mary – you were all such a pleasure to work with. 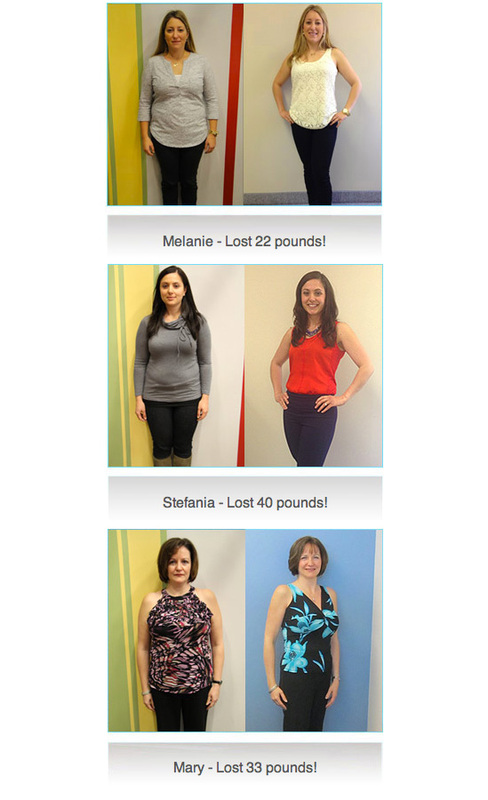 Check out some of their results! I received a letter this month that I wanted to share with everyone... I just love receiving these emails and hearing this!